Bossa Nova Rhythm Guitar - The Lesson explained. Not long after I heard Hank Marvin and The Shadows playing 'Apache' in 1961, my parents bought my first guitar. I was 11 years old and just HAD to twang. In fact while I was waiting for it, I rigged up a slab of wood with some wire that I'd tightened up with screws just to be able to see and hear for myself what happened when you plucked tightened wire. Once I got a real guitar, It didn't take long to figure out the melody line to Apache and soon after, my dad brought home an album called 'Jazz Samba'. It was one of the first commercially successful 'Bossa Nova' LPs, featuring saxophonist Stan Getz and the brilliant Charlie Byrd on guitar. I fell in love right then and there with those rhythms and those insane chords and those beautiful melodies. I knew for sure then that I would make playing guitar my life and that one day I'd be able to play like Charlie Byrd. Along the way, I discovered a whole lot of other styles of music, and I went off on my own rootsy rocky slide tangent, but I still listen to those tunes and melt. Rhythm guitar is usually associated with strumming, but the Bossa Nova (which I believe means something like 'New Wave' or 'New Trend' in Brazilian) is a great example of plucked rhythm guitar ... fingerstyle rhythm guitar. This lesson is my rather crude attempt to teach this feel, which is basically a Samba. I've strung together a few chords that conjure up the right flavor and done my best to get it feeling the way it should. You'll quickly see that it's a combination of an alternating bass line and plucked chords. I tried to keep it consistent throughout, but you'll see and hear a few little variations here and there. The bass line for the most part alternates between the root and fifth, which is the most common movement for bass lines, but I missed out on one during the Am bit and the G chords don't lend themselves to playing the fifth very well, so I just stayed on the root. This progression is in C, but quickly moves out of key. I won't bother with the Roman numerals here ... they'd be more confusing than anything else. Most of the chords are dominant 7ths, though, and Dom7ths keep acting as V chords of new keys (as I wrote about in the last lesson), so it really is a series of key changes. The changes eventually bring us to G7, which is the V chord of C, so the whole thing starts again. This isn't quite a 'circle of fifths', but close to it. The bass notes fall consistently on the first and third beats of the bar and they act as anchors for the syncopated rhythm of the plucked chords. The full pattern sort of IS the Bossa Nova and you can hear how the combination of bass notes and plucked chords becomes a very solid rhythm guitar part. By the way, the animated fretboard in the movie shows just the notes that I'm playing as red dots. If a string has no red dot, don't play it. Also, the dots just show the chords, not the detail of the plucking. The detail is in the tab below. I guess I needn't mention it again, but I will: it's the flow that you need to work. I avoided using barre chords to keep it simple, and I think most of the voicings are pretty easy to get the fingers around, so once you do get them down, concentrate on the flow, the feel, the vibe. Part of achieving that is in the way the plucking fingers act as muting pads. If you watch and listen carefully, you'll see how they choke off the ringing of certain beats just before plucking again. The tab shows this as 'rests', those little symbols that look like '7' ... it's a subtle thing, but once you get it, you've got it for good. You'll also see that there's a single-finger-pluck in amongst it all, a tiny detail but one that keeps it all lilting along à la Bossa Nova. Once you do get the pattern down, try it out on other chord progressions. You'll see how you can quickly turn any piece of music into a Bossa Nova. I suggest before you start changing chords, you just sit on just one chord for as long as it takes to get the feel of the rhythm down. About the chords, for any theory buffs. You may not recognize all these chords. Remember that chords are not just those little cluster patterns of notes you see in song books. The way the guitar is tuned does make it practical to cluster them together like that, but in reality chords are just a selection of notes that are played together. They can be spread out if it's more convenient to play them like that. The A7 I use here, for example, is a combination of the open A chord (the two bass notes, 1 and 5) and a fragment of the barred A7 chord at the 5th fret that consists of the b7-3-5 ... so the sum total (1-3-5-b7) is a A7 chord. The Am and Am7 are also a combination of the open and fifth fret barre positions. You'll see that 1 dropping down to a flat 7 to turn the Am into Am7. The C6 may not be immediately recognizable either ... it doesn't even have a root, but in the context of the Cmaj7 that precedes it and the alternating bass line, it can only be a C6. It consists of a 5-3-6 of the C scale. If you're at the stage where you want to be able to quickly 'see' chords like this, as spread out entities that use the whole fretboard, I recommend my book/DVD PlaneTalk. Once you digest that lesson, you'll see how all chords are one long pattern that you can jump in on anywhere you want ... a 'super-chord' as one PlaneTalker put it. Enjoy the lesson, as always, have fun. 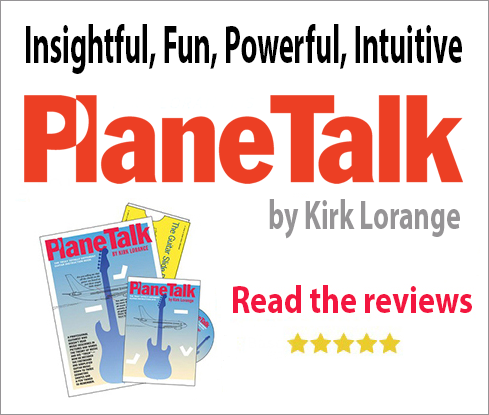 As well as putting together these guitar lessons, I am also the author of PlaneTalk - The Truly Totally Different Guitar Instruction Package, which teaches a mindset, a way of thinking about music and a way of tracking it all on the guitar fretboard. Yes, there IS a constant down there in the maze of strings and fret wire, a landmark that points to everything at all times. I call it The Easiest Yet Most Powerful Guitar Lesson You Will Ever Learn and many testimonials at my site will back up that rather superlative description. 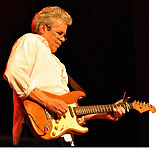 If your goal as a guitar player is to be able to truly PLAY the guitar, not just learn by rote; to be able to invent on the fly, not memorize every note; to be able to see the WHOLE fretboard as friendly, familiar territory, not just the first 5 frets and to do it all without thinking about all those scales and modes, then you should read more here.